It's not often you see a cellist plucking his instrument with a fish (unless of course, he's a Dutch free-jazz player, where its close to compulsory). But Svante Henryson, the musician in residence for the latest instalment of this excellent annual festival in the arctic port of Bodø in north west Norway, is no ordinary cellist and the fish (dried, mercifully, and played both in and out of its plastic shrinkwrap), had its own role to play, too:"This year's festival fish is stockfish!," proclaimed the pre-event publicity, jauntily. 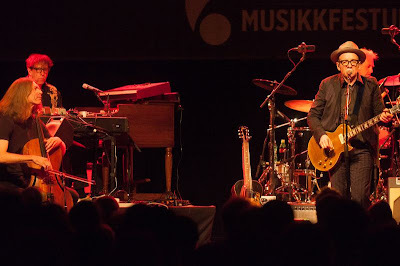 Henryson's role - perfect for a festival which mixes classical and jazz with a little folk and pop - meant he guested with almost everyone, from Elvis Costello and the Impostors, with whom he delivered a thrilling improvised solo full of swooning glissandos on 'Shipbuilding', to the Brazilian-themed folk-pop of his fellow Swede Lisa Nilsson, in whose regular band he plays, to jazz with accordionist Stian Carstensen and pianist Jon Balke, plus any number of cameo roles and special performances. These included, besides the incident with the fish, in which he was accompanied by Lisa Nilsson's amazing percussionist from Bahia, Sebastian Notini, a duet with the tamboura drone produced by his own iPhone. At one of the festival's opening soirees he had mixed the habanera from Carmen with 'Waltz for Debbie' by Bill Evans, in a duo with the fabulous, operatically-trained jazz singer Tora Augestad. 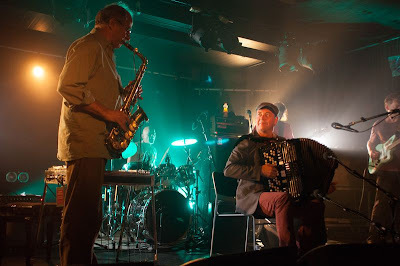 Augustad also fronted what for me was one of the festival's great hits: the sort-of-supergroup Music For A While, with Stian Carstensen on both accordion and pedal steel guitar, Mathias Eick on trumpet, Martin Taxt on tuba, and the drummer Pal Hausken (of In The Country). Pairing a selection of Brecht/Weill and cabaret songs from their previous album, Weill Variations, with almost the whole of their latest release, Graces That Refrain, dedicated to re-arrangements of renaissance and baroque music by Dowland, Purcell and Handel, the band created a unique amalgam of sensitive, chamber-jazz in the accustomed Norwegian style with full-blooded, and very passionate instrumental and vocal improvisations. By contrast, Carstensen's appearance with his own band, Farmer's Market, seemed rather hobbled by the club setting, going for full-on Saturday night function intensity in a variety of world music and pop styles where the subtlety of the individual voices got lost somewhere between art and entertainment. Following Farmer's Market for a midnight show on the same club stage was another great discovery, for me if not for Norway: the singer, rapper and poet Miss Tati is a Norwegian-Angolan from Bergen of whom - although her début album is still awaiting release,- it would be hard to say that she is in any way inferior to Eryka Badu, a clear influence. Backed by a DJ/mixer who had come with her from Bergen, and a funky rhythm section from Bodø with whom she had rehearsed for just that day, Miss Tati was a total star from start to finish. As to Bodø (pronounced Buda), it is something of a star awaiting discovery itself. A very pleasant, unpretentious small city of close to 50,000, and the capital of Nordland county, its economy is based on the recent exploitation of gas as well as fish (the herring, before it disappeared, and now dried cod), and on the proximity of a nearby Nato airbase whose f16 fighters rent the air with a mighty roar as they continue a post Cold War dance of diplomacy with the Russians over the nearby border. That Bodø does not have the old world charms of Bergen is in some ways a relief, and in any case entirely understandable: there are no old buildings left because the Luftwaffe destroyed the entire town in one single bombing raid in 1940. The inhabitants, who had fled to the hills in anticipation of the attack, were able to look down and see their homes reduced to ashes. With the entire population now homeless, the Swedish Red Cross stepped in and sent prefabricated houses that, as they arrived in December, when there was no sun, and a blackout to boot, had to be constructed in the dark. In view of these events, you understand why Swedes like Svante Henryson and Lisa Nilsson are so popular here. You can still see the sole remaining street of what was called Swedish Town, close to the festival venues of the Bodø Cultural Centre and the Cathedral, today. 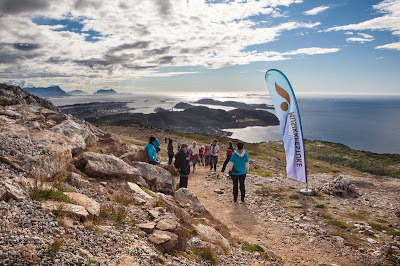 In fact you can see everything in Bodø in an afternoon, and the airport is so close to the centre that you can even walk to and from your flight. As those F16s need a long run-up there's also a runway suitable for international flights, when they come. A direct flight from London might be the first beneficiary, perhaps too late for a Northern Lights jazz festival with Mike Stern and Steve Gadd that is scheduled for January (there's a classical festival in March, too) but worth keeping an eye on.